The fields of the Sacramento River floodplain generate much of the nation’s rice supply—but if managed just right, it seems they could also help produce wild fish. A two-year experiment led in part by UC Davis scientists has revealed that baby chinook salmon can thrive in submerged rice paddies, where sun-warmed waters generate algae and phytoplankton that provide essential food for young fish and other creatures. Before the Sacramento River was tamed with dams, levees and canals, vast floods were a regular event, according to Jacob Katz, a biologist with the nonprofit CalTrout, who has directed the so-called “Nigiri Project”—symbolically named for the classic sushi presentation of raw fish served on a wedge of rice. This historic ephemeral swamp, he says, helped support huge populations of animals. “The ducks that blackened the sky and the runs of 2 million salmon that once came up the Sacramento River were produced by the incredible productivity of these marshlands,” Katz said. To produce their results, the researchers replicated the historic flood events of the Sacramento Valley by artificially inundating a small rice field in the Yolo Bypass floodplain in early 2012 and again in 2013. Each time, they released thousands of young salmon into the shallow waters. After several weeks, the scientists recaptured and measured their sample fish. They found that the salmon from the flooded fields had grown remarkably fast and were between 3- and 3.5-inches long. By comparison, baby chinook salmon of the same age in free-flowing sections of the Sacramento measure about 2 inches long. That’s because cold, fast-flowing river water provides relatively little shelter for baby salmon, as well as relatively little to eat, according to Katz. “But these flooded marshes are like a buffet for baby fish,” he said. Such a size difference in young fish can give them the advantage they need to survive to adulthood in the ocean, where salmon spend most of their lives. 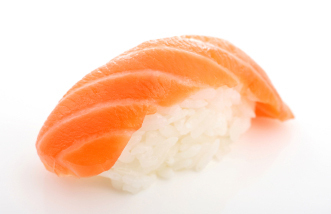 This makes the Nigiri Project’s findings potentially valuable to the struggling chinook salmon population, which has fallen to record low levels in recent years. Katz has collaborated on the Nigiri Project with Carson Jeffres, a biologist with the UC Davis Center for Watershed Sciences, and Ted Sommer and Louise Conrad, both with the state. In the 2013 rendition of the experiment, they released some 50,000 fish onto 18 acres of fields, donated temporarily to science by Cal Marsh and Farm Ventures, a group of landowners. But Katz believes there may be as many as 10,000 acres of farmland that could be made available for use as seasonal fish nurseries. Jeffres noted that rice production would not be impacted by the program. “We would just need water out there for a window of several weeks between January and March, before the farmers start planting in the spring,” Jeffres said. Jeffres and Katz’s hope is that government agencies will incorporate the methods of the Nigiri Project into the state’s wildlife-management programs. The idea is to take advantage of Sacramento Valley flood events, which occur once every two or three years, by containing the water on the fields even after the swollen river subsides. Katz points out that the full-scale size of his experiment makes replicating the concept a cinch for fishery managers. And if the plan unfurls as Katz and Jeffres envision, we can have our fish—and eat our rice, too.